Grand Opening Ceremonies and Statue unvielings took place July 4, 2008, with over 3000 people attending. Prime Minister Stephen Harper, Alberta’s Premier, Ed Stelmach, Solicitor General Fred Lindsay, MP Rob Merrifield and MLA George Vanderburg, as well as RCMP Deputy Commissioner Bill Sweeny, Mayor of Mayerthorpe, Douglas McDermid and Mayor of Whitecourt, Trevor Thain were among the dignitaries in attendance. The RCMP Regimental Pipe & Drum Band led the march of RCMP Officesr, Alberta Sherrifs and Emergency Servicemen from the Royal Canadian Legion to the Fallen Four Memorial Park Mayerthorpe. Each of the four statues was unveiled individually by society members, Kids 4 Cops, RCMP and Government. The center obelisk was unveiled by Prime Minister Stephan Harper and RCMP Deputy Commissioner Bill Sweeny. It was a culmination of three years of dedication to the project by Soceity members, hundreds of volunteer hours, and the generous support of thousands of individuals, and corporate donors from across Canada. 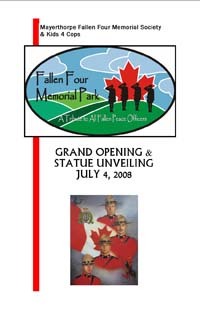 Since the unveiling, the Fallen Four Memorial Park has played host to thousands of visitor from across Canada, the United States and the world. People come to pay their respects to the Fallen Four, many remember and pay tribute to other peace officers who have died in the line of duty. They leave flowers, notes and messages of praise and appreciation in front of the statues and obelisk. It is truly symbolic of how Canadians feel about their RCMP, and municiple Police servicemen.